A dragon fruit looks like a hand grenade. With scaly, forbidding outer skin but a soft heart—kind of like your favorite movie superhero*. In reality, it’s a cactus fruit native to Mexico and Central America where it goes by its proper name, pitaya. It is also very popular in Southeast Asia, especially Vietnam, where it is believed to have been introduced by the French and now cultivated for export. The plant’s flowers bloom at night and are pollinated by bats. How’s that for goth? Despite its macho exterior, it’s quite easy to open and scoop out the flesh. Simply cut it in half from top to bottom and have at it like you would an avocado. There is no pit though—instead, you will find rather firm white flesh peppered with tiny black seeds which you consume with the pulp. Halve the melon along the equator, scoop out and discard the seeds, then using a melon baller scoop out the flesh. 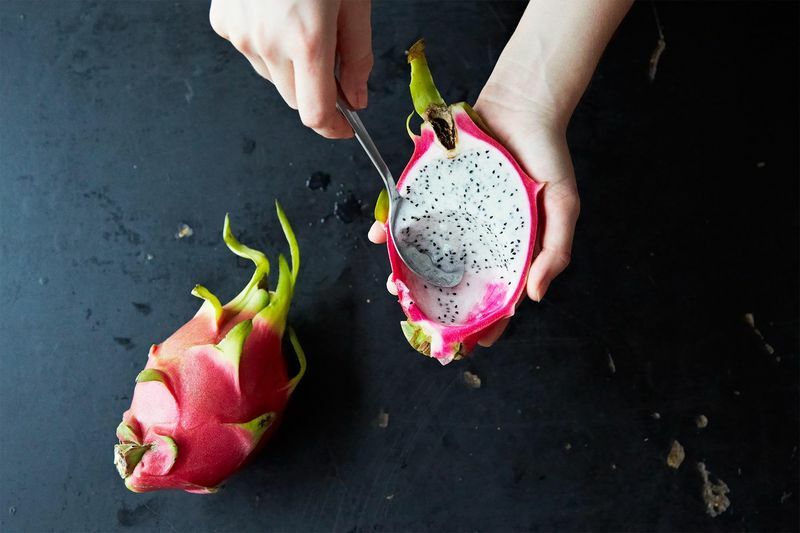 Cut the dragon fruit in half from top to bottom and use the baller to scoop out the insides. Do the same with the kiwis. Pit the cherries. Combine all of the fruits in a serving bowl. Tear up the mint leaves and mix those in. Finish with a dusting of powdered sugar. Hull the strawberries and slice them into quarters, top to bottom. Add the salt and sugar. 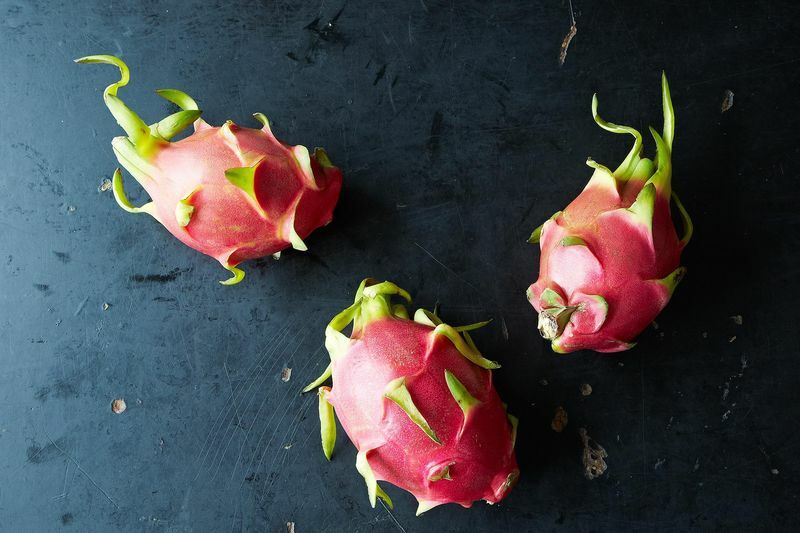 Cut the dragon fruit in half and scoop out the flesh, mash it up well. Combine the strawberries, blueberries, and dragon fruit pulp together, and then fold in the yogurt. Taste again for sugar and you are ready to go. 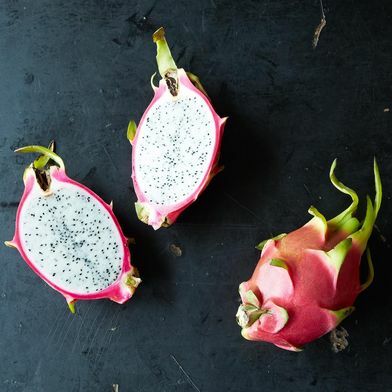 But I think one of my favorite ways to consume dragon fruit is to blend it into a drinkable form, like in this refreshing, non-alcoholic beverage. I’ve also made ice cream with dragon fruit and then turned it into a beverage that is almost a fountain drink with a Vietnamese twist. *Mine happens to be Ryan Reynolds as Deadpool. 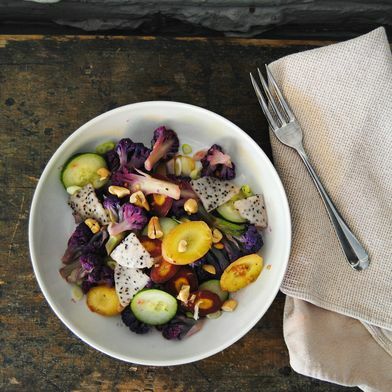 This article was written by pierino from Food52 and was legally licensed through the NewsCred publisher network. Please direct all licensing questions to legal@newscred.com.